There have been many changes in law enforcement and respect for police in the century since Patrolman Moore’s passing. Since we’ve been observing National Crime Prevention Month during October, it’s an appropriate time to consider some of these changes. Certainly, the addition of women to the blue ranks, the advances in technology, the nature of crimes and crimefighting, the scope of police duties, length of shifts and of service, to name a few. Many of those changes have been arguably positive; however, not every municipal neighborhood, especially areas where race, language or nationality are at variance with those of the police force, boasts the level of respect that John Moore and his fellow officers enjoyed in America of the late 1800s and early 1900s. A police officer’s lot is certainly a dangerous one in America today! 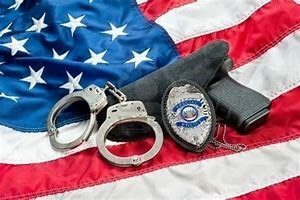 Throughout our nation’s history, an estimated 20,789 police officers and law enforcement personnel have died in the line of duty from a variety of causes – severe weather, shootings, explosions, traffic accidents, heart attacks or other illness on the job. A report on PBS News Hour indicated in recent years the number of police deaths was declining, but death by firearms was significantly increasing. The deaths of unarmed citizens from police officers is also troubling, and the subject of intense debate in our society today. The Marshal Project is a non-profit, non-partisan news organization that seeks to create and sustain a sense of national urgency about the criminal justice system. Along with the Washington Post, the Marshall Project has attempted to bring some clarity to the issue of civilian deaths at the hands of police. Some of the research to date suggests that unarmed Whites die in greater numbers than African or Hispanic Americans. Even in efforts to report objectively and factually, there is controversy surrounding most events of either police or civilians, but that should not prevent us from making every effort to uncover the truth about each incident. Clearly, senseless death of either police officers or unarmed civilians killed by police officers should be prevented as much as possible and everyone has a stake in finding solutions to this serious issue. Undoubtedly, the debate over “Black Lives Matter” or “Blue Lives Matter” will continue, at least until Americans find a solution to the divisive issue of race. That is an issue that has been present in American society for four hundred years, even before there was a United States of America, and sadly it is likely to persist for some time to come. However, we need to work to rebuild respect for those who have the responsibility to enforce our laws. Among the programs that are building a strong track record toward that goal is one developed by the University of Southern California (USC) Social Work Department and the Los Angeles Police Department that “places social work interns in the police department so that they can collaborate with police to address social issues that affect local communities,” according to Everyday Democracy. Nationally, efforts to reform the criminal justice system are a part of a respect rebuilding effort, as is improved education and training for those who seek careers in law enforcement. Policies and training on when use of deadly force is justified must be part of that training. An important part of that effort needs also to focus on respect for the law itself by our political leaders, the media, the education and legal communities, indeed, among all citizens and those who aspire to citizenship. The American Society for Public Administration (ASPA) is well-positioned to be among the leaders of a national effort to promote greater respect for the law by our actions, our teaching and our public service. Author: Richard T. Moore has served in both elective and appointed public office at local, state, and federal levels of government. He served for nearly two decades each in the Massachusetts House and Senate, as well as being chosen as President of the National Conference of State Legislatures. A former college administrator and adjunct assistant professor of government at Bentley University and Bridgewater State University, Mr. Moore is a long-time member of ASPA serving terms as Massachusetts Chapter President and National Council member. He also has a personal interest in finding solutions to this issue as great grandson of a police officer and as Godfather to two African-American teenagers and several Caucasian children.